Inspired by a salad I ordered at a local spot to share with colleagues but ended up devouring more or less by myself, this shaved brussels sprouts salad is a bit off the common path. Dill is usually associated with spring and early summer cookery, so seeing it matched on the menu in fall with such a classically autumnal vegetable peaked my interest. 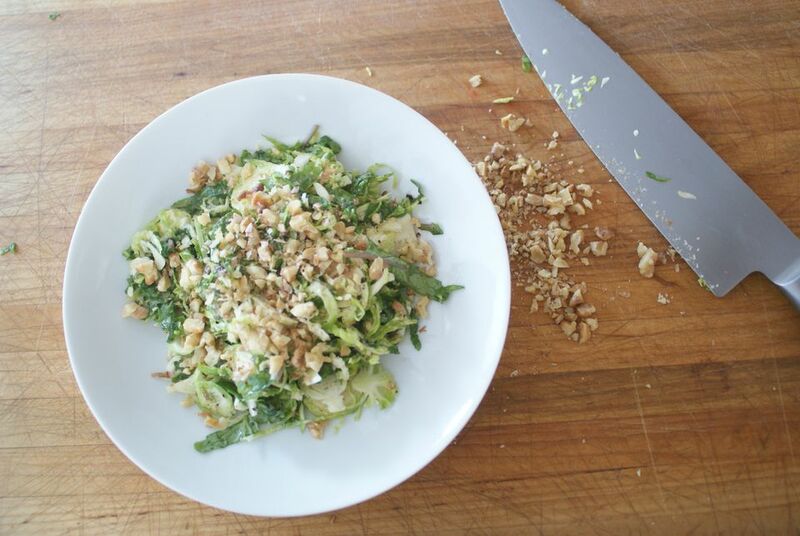 I was rewarded with a bowlful of sweet tender dill brightening up the sharp crunch of shaved brussels sprouts, all topped with crunchy bits of finely chopped roasted almonds. At home I experimented with adding salty aged pecorino to the mix. Either or both almonds and the cheese work, but nothing quite beats the added crunch of nuts on top of this fresh creation, and then the cheese adds a good hit of umami. If using just almonds, make sure they are salted, since that salty element is absolutely key to bringing this salad to its fullest self. Trim off the stem ends from the brussels sprouts. Remove the darker external leaves (discard them, if you must, but I always save them for dishes like a warm salad sauté). Use a kitchen mandoline or a sharp knife and a steady hand to cut the brussels sprouts lengthwise as thinly as you can. Set them aside. Peel and mince the shallot, and put it in a large bowl (large enough to hold and toss the brussels sprouts once the dressing is made!). Stir in the oil, vinegar, and sugar. Dip in a shaved brussels sprout and taste. Adjust vinegar for more acid or sugar for more sweetness to taste. Remember that you will be adding the salty element at the end with the almonds and/or cheese. Add the shaved brussels sprouts and the dill, and toss to combine. You want everything evenly coated with the dressing. Divide between 4 to 6 salad plates or bowls, if you like, or leave in a large serving bowl. Finely chop the almonds and/or finely grate the cheese. Sprinkle one and/or the other over each serving. While this salad is definitely at its best right after being made, the leftovers are nothing to sneeze at. Keep covered and chilled for up to 2 days for a less stunning but equally delicious treat.